Providing your cat with plenty of scratching options (like a scratching post, scratching board, or cat tree) will help keep kitty away from your furniture. Sometimes when cats get a case of the zoomies—you’ve probably seen it: kitty gets wide eyed and starts running around the house for seemingly no reason—they’re looking for a place to sink their claws in. If a scratching post is available, cats are usually great at using them. We are all cat lovers, but there is no denying that sometimes it can be difficult to sleep when kitty gets playful and begins running around the house at night. Fortunately, cats are creatures of habit: they love routines! Playing with your kitty every night for 15 – 30 min. before dinner will follow the natural play (hunt), eat, then sleep instinct. This will make kitty feel very content and happy while ensuring you get a good, full night’s sleep. Win-win! Does kitty need a buddy? If you’re noticing that your young cat plays too rough or keeps you up with excess energy, it might be time to get a kitty friend for your feline. 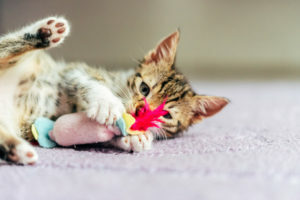 Young kittens raised alone can develop a set of undesirable behaviors called Single Kitten Syndrome—but even teenage kitties and some active adults might appreciate having a friend to play with. Owning a cat can be one of the greatest joys in life: we want kitty to be happy, and we want you to be happy, too! Creating good habits will not only help kitty thrive, but will make your cat-human relationship one of the most special and enjoyable relationships you have. If you have any questions or if you need help finding a kitty friend, please let us know: info@seattleareafelinerescue.org.